The chance to be king (or queen) of a castle rarely comes along, but as an ancient structure - complete with jousting field - is put on the market, aspiring royalty have the opportunity to buy Wigmore Castle in Herefordshire. As the saying almost goes, an Englishperson's home is their castle. But for the benefit of those who would rather a castle was their home, BBC News takes a look at some that have been up for sale. Wigmore Castle may seem a bit of a disappointment to those seeking a baronial lifestyle, as it is now a ruin. But don't let that put you off. The castle, originally a wooden edifice, is believed to date back to the 10th Century. Its past, involves murder, treachery and, brilliantly, a woman called Lady Brilliana. It was Lady Brilliana who was responsible for turning the castle into ruins, when in 1643 she ordered Parliamentarian troops to dismantle the walls to prevent it from being used by opposition forces. As an added bonus, the Grade I-listed building is in the guardianship of the secretary of state, so the new owners would have no liability for repairs. As well as the ruins, situated near Leominster in Herefordshire, the buyer will get about 32 acres, including a moat, some woodland, a jousting field, workshop and orchards. Perhaps the jousting field will attract a new owner from the US state of Maryland - jousting became its official individual sport in 1962, and the state holds tournaments throughout the summer. The official team sport, by the way, is lacrosse. Driffield Castle is perhaps even less prepossessing than Wigmore Castle, being a grassy mound. But the earthwork monument, on Moot Hill, is protected because it's archaeologically important. Underneath the 11th Century motte and bailey fortress are believed to be the remains of Aldfrith, the king of Northumbria (685-704). If you are lucky enough to find one of the silver sceattas - coins minted in his reign - they sell for more than £1,500. They have Aldfrith's name on one side, and a creature - which experts have variously described as a lion or a horse - with a three-pointed tail on the other. Driffield Castle was sold in 2011 for £23,000. Caverswall Castle, currently up for sale for £3m, is a tad more luxurious than most. It has 16 bedrooms, a moat, three converted turrets, an orangery and a dungeon. 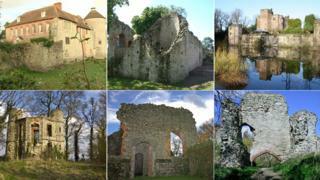 It was built on the site of an Anglo-Saxon Manor in 1275, and the earliest recorded owner was Ernuf de Hesing. The castle then passed to Sir William de Caverswall, who in 1230 received a "license to crenellate" or fortify the house. The castle fell into decay until 1615 when the Mayor of Stafford Matthew Cradon, a wealthy merchant, bought and rebuilt it as a Jacobean mansion in about 1625. During the English Civil War it was used as a garrison by Parliamentary forces, and the Wedgewood pottery family lived there during the 1880s. Perhaps the occupants who left the most lasting legacy was an order of Benedictine nuns. The castle became became a sanctuary to the order which had escaped the French Revolution. It is rumoured one of the nuns haunts the place. Dinton Castle, which sold in 2012 for £56,000, is an octagonal folly built in 1769 on a Saxon burial ground by Sir John Vanhattem. Sir John used it to store his collection of fossils - not inside the building but set into its walls. Rumours abound that the folly is haunted by John Bigg, who died in 1696. Known as the "Dinton Hermit", his shoe is on display at the Ashmolean Museum in Oxford. Bigg was a clerk to Simon Mayne, an Aylesbury magistrate and MP, who owned Dinton Hall. Mayne was one of the judges at the trial of King Charles I in 1649, and it is said Bigg may have been one of the hooded executioners of the king. Mayne was eventually tried and sentenced as a regicide and died in the Tower of London in 1661. Bigg became a hermit, living in an underground cave at Dinton Hall, until his death. Some believe it was because he feared retribution for his involvement in the royal execution, while others suggest it was due to the remorse he felt over the king's death. His shoe was given to the museum by Sir John Vanhattem. It's made up of hundreds of patches of leather, which the hermit nailed on top of each other as each piece wore out. An 18th Century illustration of Bigg shows the rest of his clothes were also made up from patches of leather and he wore a strange horned cloak. It is said that he lived by begging silently for food but only ever asked for leather - and, presumably, nails. Westenhanger Castle, which went on the market in 2013 for £2.6m, was owned by King Cnut - the ruler who pointed out even a monarch could not stop the tide coming in. Cnut gave it to a local archbishop in 1035 in the hope it would ease his passage to heaven. In 1540 the property was transferred to the Crown by Henry VIII who, until his death seven years later, entertained lady friends there. His daughter Queen Elizabeth also used the castle, hosting house parties of more than 300 people. The current building is Grade I listed and on the site of a 14th Century fortification with ruins. Westenhanger Castle also has a full-size replica of the Discovery - one of the three ships that sailed to Jamestown, Virginia - where the first permanent English-speaking settlement in the New World was established - forming a base for what would later become the United States of America. Westenhanger used to be owned by Thomas Smythe, a collector of customs duties. His son, another Thomas, became the treasurer of the Virginia Company and obtained settlement rights in Jamestown. Blenkinsopp Castle is thought to have been built in 1339 by Thomas de Blecansopp. One of his descendants, Bryan de Blenkinsopp, was said to be so motivated by wealth he married a woman who was unattractive but had an awful lot of gold. The chest containing her riches was supposedly so heavy it took 12 men to carry it. But Sir Bryan did not benefit from his mercantile marriage. His wife refused tell him where she and her servants had hidden her chest and, true to form, he left her - after which she disappeared. It was hinted at the time that the lady was an imp of darkness, sent with her wealth to ensnare Sir Bryan's greedy soul. Legend has it that she haunts the castle, and is known as the White Lady. Less ghoulishly, another famous inhabitant was Violet Loraine, who married Edward Joicey who bought the castle in the late 19th Century. Loraine was a Forces sweetheart who sang, along with George Robey, the 1916 duet If You Were the Only Girl (In the World). The castle, which was badly damaged by fire in the 1950s and extensively rebuilt, is on the market for £325,000.